But first this . . .
They’re all related and in that order. First, we plan on staying the entire Summer in our Arizona Crazy Horse park model — mostly because we want to spend some money fixing up the park model. For example, we bought a storage bed. The mattress lifts up so that you can store stuff underneath (just like the bed in our RV). Painting the park model is part of this process. I spent a day washing our unit with TSP, another day taping off areas, and two days putting on a first coat of paint. While I tried to do most of the work early in the day when temperatures are in the 70s – 80s, on Sunday I did a lot of painting in the heat. This is Arizona 90+ degree heat with about 8 percent humidity. Not the best time to do work of any kind. I have a feeling that the heat had a lot to do with what happened next. During dinner — which was a tender pot roast with hard carrots — some food got stuck in my throat and I had difficulty swallowing. It wasn’t Heimlich maneuver time because I could breath ok, but I started throwing up on our garage floor. Meanwhile, sensing the urgency of the situation, Jan brought back an entire group of people from a nearby house party. What a scene. I’m sure I looked like death warmed over and several of the people gave me that “Oh my god!” look while others made suggestions ranging from jumping up and down to drinking Gatorade. After a couple of minutes, I was able to get around and crack some jokes, but Jan suggested going to the local Emergency Room. I thought it was a good idea too. Where Can a Guy Get a Drink? After a saline injection at the hospital, the food blockage in my esophagus cleared, and I could swallow again. Yahoo! The Emergency Room was a trip. According to a medical tech who gave me the saline shot, it was an unusually busy Sunday night . . . heroin overdose, car crash victim, me, and a cast of others. The ER doctor was great. If you have to end up in an Emergency Room, he’s the doc you want. He was multi-task man — giving direction to the entire staff, finding time for every patient, and possessing a superb sense of humor. Kudos doc! Jan was excellent during all this — she kept calm and got me to the doc on time. So in under an hour, I was “cured”, told to eat small bites and chew thoroughly, and paid the $300 ER bill. Cowabunga Tom, glad you recovered from this emergency. And thanks to the quick thinking of Jan AND helpful neighbors. Please take your time renovating your new place because you’ve got all summer. You mentioned your hot weather; I’ll mention our cold weather at 30 deg. with snow on the ground……..dammit. We are NOT amused. Take care you guys. Love from Jenny and Kath. Well, both WI and AZ weather will be turning a corner soon. WI will get great weather, and AZ will get INCREDIBLY hot. WI will get mosquitoes, AZ will get mosquitoes, snakes, scorpions, and tarantulas. 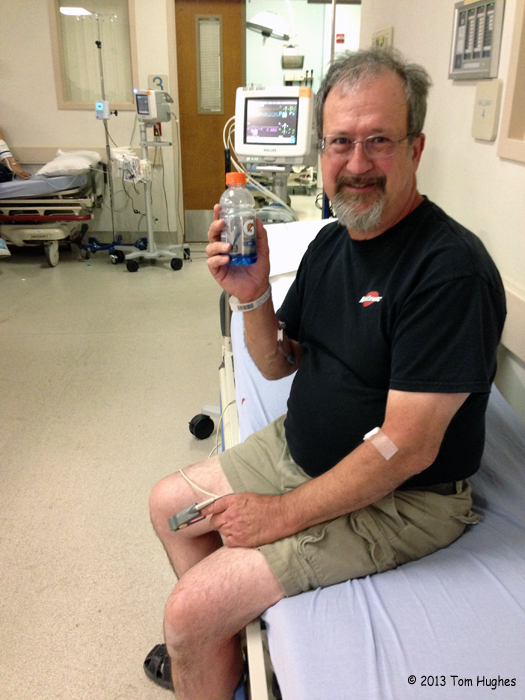 I have to say.. hard carrots trip me up.. a lot.. And.. keep in mind your electrolytesâ¦ yup.. Gatorade.. good. Yes. Be good to yourself now. I mean it. Looking at u on the ladder…..you’ve got nice legs! Seriously tho. Glad all ended in a good manner. wow! Just now catching up with your story and I’m so glad it had a happy outcome. Ditto on what Nancy said about chewing, grin. 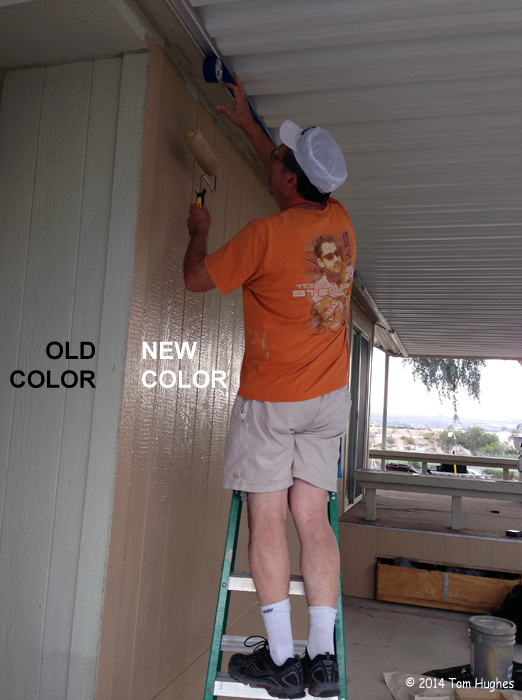 Hope we get to see the new paint look on your house. Liked the pic you posted that we could enlarge.